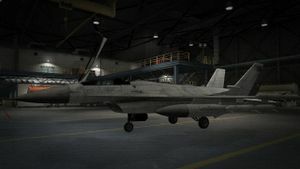 A P-996 LAZER in Grand Theft Auto V.
The JoBuilt P-996 LAZER is a military fighter jet in Grand Theft Auto V.
Based on the F-16C Fighting Falcon and F-35 Lightning II, the P-996 LAZER is equipped with dual miniguns and AIM-120 missiles. Unlike the Hydra, the plane does not feature countermeasures of any kind or the ability to take off and land vertically. The P-996 LAZER is a fast jet, capable of barrel rolling. Barrel rolling helps to avoid incoming missiles that are fired at the player, as due to the lack of countermeasures of any kind. However, the P-996 LAZER is fragile, and if it is hit too many times, the engine will die, and the player must eject. If the player successfully steals this jet from Fort Zancudo, they must place it in a hangar as soon as possible, as there seems to be a "kill switch" that kills the engine. If the player then exits, they will not be able to enter it again. The P-996 LAZER does not contain any countermeasures of any kind, resulting in the player having to perform barrel rolls in an attempt to dodge the incoming missiles. The "96" in the P-996 LAZER's name is a reverse of "69". "LAZER" is a corruption of "laser". This page was last modified on 25 June 2015, at 06:22.